Could it be simple to solve the NHS £886 Million pound deficit in 2017? Is it the fault of the Rich, the Super Rich, Tax Avoidance, Bad Government?.. Or is there a simple solution? Here from my art studio where I normally do my drawings, paintings and how to draw videos I listen to the radio, like so many of you, and hear the news. So here are some simple thoughts, not a rant, from a simpleton. Musing whether there is a solution that can very quickly sort out the NHS, not just now but here after too. There are some simple mathematics involved and it could be that a few could sort this out – or many – or a combination of the two. So get a brew and listen to my thoughts on this subject in this short Youtube Video. My links to the articles in the video are below. Sunday Times Rich list – you need to subscribe to the online paper to see it. This entry was posted in The Art of Billy Vlog and tagged BBC, Billy Art, billy the artist, Jeremy Vine, NHS, NHS Deficit, Sunday Times Rich List, The NHS on 21/02/2017 by billy. Here is a 30 second vlog showing Jenny Tinmouth signing her fine art prints of her on the full factory Honda Racing BSB Fireblade CBR1000RR Superbike taken from my oil on linen canvas painting. This entry was posted in Motorcycles, The Art of Billy Vlog and tagged BSB, CBR1000RR, Fireblade, Honda, Jenny Tinmouth, Oil Painting on 06/12/2016 by billy. Here si a quick Vlog Update about my Michael Dunlop 2016 Isle of Man Senior TT and Jenny Tinmouth 2016 BSB oil paintings. Plus a little information about my ‘How to Draw’ videos. This entry was posted in How to Draw, Motorcycles, The Art of Billy Vlog and tagged Billy Art, billy the artist, BSB, How to Draw, Isle of Man TT, Jenny Tinmouth, Michael Dunlop, Oil Painting on 22/10/2016 by billy. WIP time-lapse YouTube video update on my Guy Martin 2015 TT Smiths Racing Triumph Daytona 675 oil painting. With a little Vlog update on our family and why this has taken soooo long. This entry was posted in Motorcycles, The Art of Billy Vlog and tagged Guy Martin, Isle of Man TT, Oil Painting, time-lapse, Triumph Motorcycles, TT on 10/03/2016 by billy. Quick little Vlog on my latest three art projects. Joey Dunlop, Jonathan Rea and Guy Martin oil paintings. This entry was posted in Motorcycles, The Art of Billy Vlog and tagged Guy Martin, Isle of Man TT, Joey Dunlop, Jonathan Rea, TT on 26/06/2015 by billy. 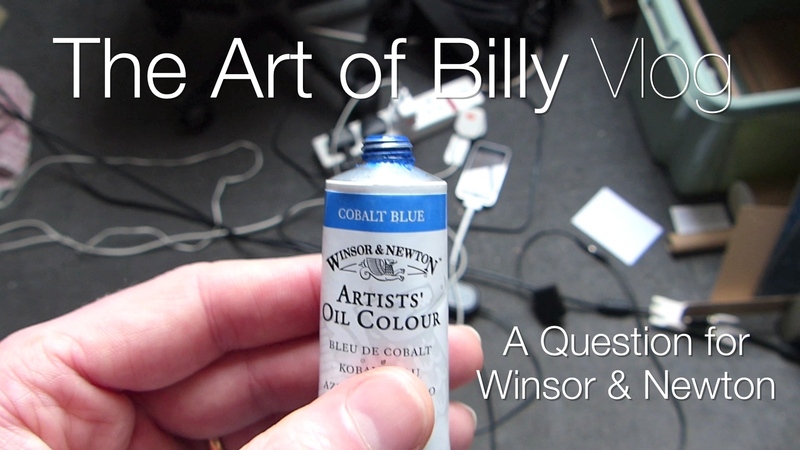 This Vlog is a question to Winsor & Newton in regards of their artist oils range of wonderful paints. Yesterday I painted the left arm of Michael Dunlop’s leathers on my oil painting of him fro the 2014 Isle of Man TT on which he made history for BMW by winning for them for the first time in 75 years at the world famous TT races. I used Cobalt Blue along with Ultramarine and a few other colours and I work alla prima most of the time to get the detail I require but when I came to put more Cobalt blue paint on my pallete to do Michael’s right boot a lot of oil came out and not the ‘cream cheese’ I am used to painting with. This also has happened with Winsor Lemon and my Ivory Black. This very oily paint stopped me from doing the detail that I normally achieve with your excellent paints. I can’t think that this is normal so I am looking forward to Winsor & Newton letting me know why this is happening and if it will stop or if I have some dud paint. This entry was posted in Motorcycles, The Art of Billy Blog, The Art of Billy Vlog and tagged Isle of Man TT, Michael Dunlop, Oil Painting, Vlog on 20/09/2014 by billy. Just a quick thought Vlog on what will happen to the cost of post if Scotland votes for Independence. I currently can post a large Letter to Northern Ireland and it costs £1:20 and if it goes to Sourthern Ireland it costs £3:70 as it is not part of the UK and classed as a foreign country. Will this happen to Scotland and the post? Will a CN22 customs form be needed as they will not be able to join the EU straight away either? Just a thought from someone who posts prints to Scotland for my work. This entry was posted in The Art of Billy Blog, The Art of Billy Vlog and tagged Post Office, Royal Mail, Scottish Independence, Vlog on 06/08/2014 by billy. Four of the blessings of working from home (along with family) are the Hens at the bottom of our garden. Here is a short video showing the chickens who live in ‘Stalag 13’ and have a lot of space to cluck around in and who provide us with lovely free range eggs. This entry was posted in The Art of Billy Blog, The Art of Billy Vlog and tagged garden, hens, keeping chickens, poultry on 03/08/2014 by billy. Just a short video update Vlog in the link below on how as an artist you have to work through being tired, just like anyone else who goes to work, and not the rubbish pontificated by some that they can ‘only paint when they are inspired’. My new art includes The Isle of Man TT’s fastest newcomer Peter Hickman and some new Toy Story ‘How to Draw’ films. This entry was posted in How to Draw, The Art of Billy Vlog and tagged Art, How to Draw, Isle of Man TT, Peter Hickman, Toy Story on 02/08/2014 by billy.